One of the things I love most about the worldwide web is the opportunity that it affords independent publishers. Anyone with some basic skills, a little patience and some passion can create a website and start earning a few dollars a month from it. As that revenue grows many get the chance to quit the day job and work for themselves doing something that they love. That’s an amazing freedom, but the job of an independent website owner can be a scary one too. The first time you fire up your computer to check earnings and see that everything has flat-lined can leave you feeling scared, exposed and alone. What can cause a flat line? Thankfully there are not too many things that can cause a website to literally go to zero earnings overnight and it is quite rare. Many of the issues that I have witnessed causing problems during my career are easily avoided and simple disaster avoidance precautions can drastically reduce the chances of the others happening to you. Below are a few simple suggestions that can greatly reduce the stress of this happening to you. These were put together to help owners of ad-funded websites, but most of the points cover any site. The list isn’t exhausted, but represents the most common critical issues I’ve encountered over the last 2 decades of working online. Servers are usually pretty reliable, but a problem can mean traffic dropping to zero immediately. Most small publishers use managed servers, so a quick ticket to support should be all that they need to do to fix it. That does rely on using a firm that delivers fast and effective support. Hosting has become a commodity sold on price, particularly at the share-hosting end of the market. Good support isn’t cheap to provide and low cost hosting might mean that they are scrimping on infrastructure and effective support technicians. Spending a little more on hosting can make a big difference, both in terms of avoiding problems and how quickly any problems are resolved when the inevitable does happen. It can often result in a faster website too, which brings its own benefits. Avoid the very cheapest providers. Test support response when it isn’t critical. Understand, use and test the backup options provided. Use a monitoring system, such as Pingdom, to alert you to problems so that you can get them resolved more quickly. Domain Name Servers, or DNS, are what controls how email and web traffic using your domain is redirected. It is usually handled in part by your domain provider and in part by your host. When DNS is wrong it is usually quite easy to fix, but due to the way the DNS system works changes take time to take effect. This means that DNS issues can be slow to resolve. Know where your DNS is controlled and who has access. If possible have more than 2 DNS servers configured and have these served from different physical systems. Consider whether having your DNS managed by a different firm to your hosting might be advantageous. User monitoring (again Pingdom would cover this). The most common issue around domain registration that we see is a failure to renew the domain registration before it expires. When a domain expires it stops serving DNS information, meaning that services such as websites and email that use that domain immediately stop working. Because domain registrars provide a ‘grace period’ this usually just requires a hasty renewal and a bit of patience to resolve. Leave it too long though and your domain could be snapped up by someone else and you lose all rights to it. Domain issues can be some of the most problematic, but there are simple steps that you can take to lower the risk of them happening to you. Have your domain set to auto-renew. Keep payment details up to date with your domain provider and, if possible, provide a back-up payment method. Ensure that contact details are up to date and that email addresses are monitored, as these are where warnings will be sent. Keep domains locked and protect them with secure passwords. Be careful who you share those details with. Be wary of letters and emails about your domain from official sounding sources that are not the ones that you do business with. There are a lot of reasons that problems can occur with the software that runs your website. Some problems might have been inherent from the start, but not immediately obvious. Others might occur later due to an upgrade of either the server or the software itself. Ensure that you test every element of your website either before, or immediately after launch before you sign it off as complete. Understand what arrangements in place for upgrading both your server software and your CMS and who is responsible if the two become incompatible at any time. Have developers in place to deal with issues. It can be hard to find good developers at short notice when it is urgent. Track meaningful goals on your website and monitor for any sudden drops in conversion rates. Websites that use https to secure their traffic also require an up to date security certificate to ‘prove’ that they are who they claim to be. These are generally provided by third parties and have a limited lifespan. 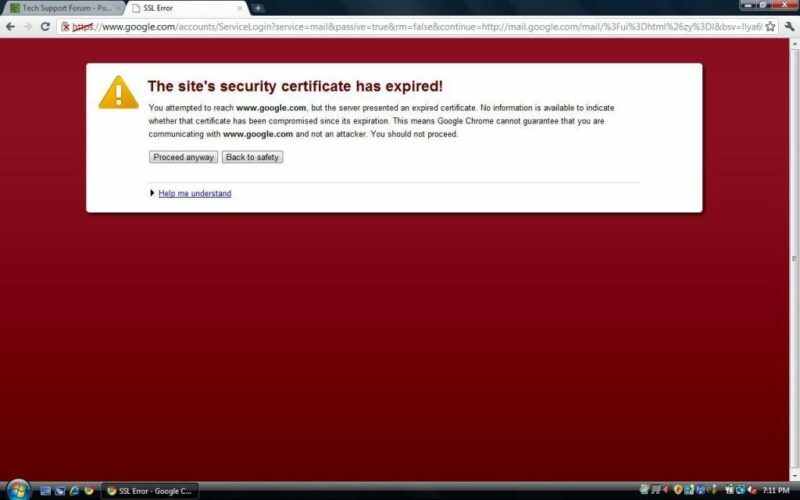 When the certificate on a website expired, visitors to that site are presented with a warning message in their browser. In recent years those warnings have become quite strong and can result in most users hitting the back button. Check your expiry date now and get it in your diary. Leave enough time to set up the new certificate before the old one expires, rather than waiting for the error messages. Ensure that your contact details are kept up to date with your certificate provider. Most security breaches affecting small publishers tend to be more subtle than the site wide defacements of old. Whilst that does mean that ad revenue is less likely to flat-line overnight, they can also be harder to fix. Protect your website with passwords that are not used elsewhere. If you log into countless sites using your CMS password you are giving it away. Keep your website software up to date and monitor the relevant security announcement lists for your CMS. Be selfish with your passwords: If you need to give them to someone create new users where possible and remove them afterwards. Limit the permissions on each user to strictly what is needed. Claim your account in Google Webmaster tools so that you are notified of any critical changes. If your website relies on ads, then ads failing to serve isn’t much better than pages failing. On a technical level there are a number of possible causes: ad server configuration, script conflicts, poorly implemented tags and network issues can all stop ads being served. More worrying for many are possible policy issues that can take longer, or even be impossible to fix. Monitor served impressions and revenue so that you are aware of sudden changes. Keep contact details up to date with all your networks and other demand sources. Court and maintain good relationships with your reps.
Take time to understand the policy requirements of everyone whose tags you show, then ensure that you stick to them. Watch out for policy changes. “I didn’t know” rarely cuts it with the big networks. Legal issues can get a site shut down almost as quickly as technical ones. If you are doing something illegal then this is an obvious risk, but issues around trademark and intellectual property infringement increasingly cause problems for website owners. In most cases this process is far from instant, moving as it does as “lawyer pace”. Surprises generally occur when hosting companies take swift action to avoid being dragged into proceedings. Be aware of, and respect, the copyright of material that you use. Consider how user-generated content can impact this. If you think this is a risk area, find out how your hosting company deals with copyright complaints. I’ve tried to cover the issues that I have most frequently encountered over the years, but there are certainly others that could be included. Traffic sources being cut-off is one, although probably saved for another long post of its own. This is particularly concerning if you rely on one or two traffic sources. The list could go on and many sites will have particular areas of concern specific to them. The most important point is to consider what the issues are that could critically impact your site and to take steps to reduce the risk of each one.